Our kids certainly latched onto this title when it arrived in our mailbox. 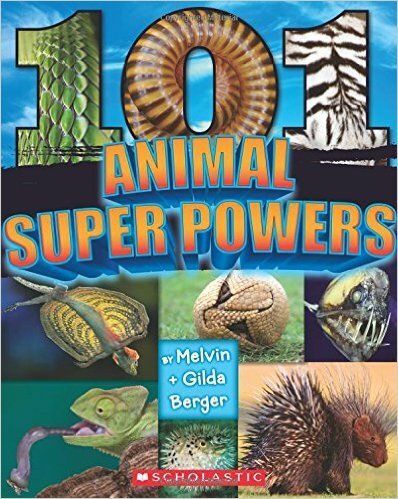 The title almost says it all: 101 Animal Super Powers . What's not to instantly love? This 104-page book offers a page spread to each of the 101 animals, detailing their particular "super power." With full-color photographs on each page, my children piled on the couch to learn what was so amazing about a guinea pig (their teeth cut like knives), electric eels (they make electricity), and earthworms (they breathe through their skin). From the Komodo dragon to mantis shrimp my kids delighted in reading a variety of unique facts about animals that they knew and some that they became acquainted with on this particular reading journey. 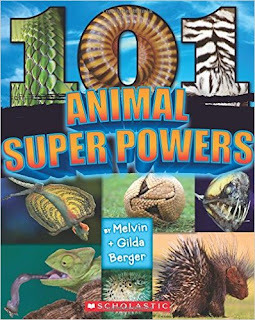 101 Animal Super Powers certainly captured their imagination on a variety of levels and they've enjoyed flipping through it many times since, drinking in those "fun facts". Highly recommended. If your kids like animals but maybe are not quite ready for a longer book about them, you might wish to check out Supersize Animals , a new Level 2 reader, also from Scholastic. Again, the title gives away the subject matter. 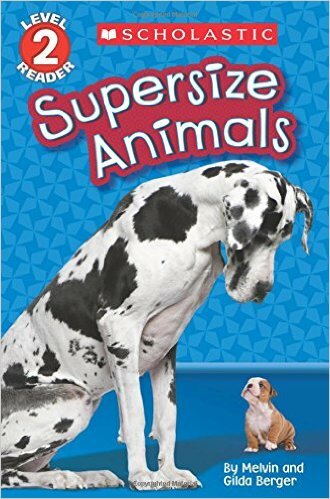 This is a 31-page book all about rather large animals, such as the continental giant rabbit (think Harvey), Japanese spider crab, and Belgian horse. I don't know about your kids, but mine are naturally drawn to the animal world and they like flipping through non-fiction titles and gathering bits and pieces of information. My littlest boy is proud that he can identify and say words like "dog" and "horse" so this made flipping through these books a little extra fun. I offer these up for your consideration if you are interested. Many thanks to Scholastic Books for sending the above titles my direction in order to facilitate a review. I received no additional compensation and all opinions are 100% my own. I'm just flabbergasted that you know Harvey!